2. All kinds of corrosive fluid transmission pipeline system. 3. Titanium bicycle tube,automobile exhaust pipe. 6. Evaporimeter;Fluid Transporation Piping etc. grade 1 can be used in the deep drawing parts for its good elongation and excellent corrosion-resistance. 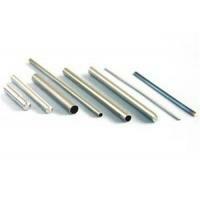 grade 2 is used the most widely in the commercially pure titanium. grade 3 is almost only used in pressure vessel. grade 4 can be use in some fittings parts and fastening pieces, but for complex shape need 300 degree celsius to form. Alloy grade 5, Ti-6Al-4V, is the most widely used in the titanium alloys because of its comprehensive mechanical, physical and chemical properties. Alloy grade 7, add little palladium in cp titanium and it has the most excellent corrosion-resistance. Of course it costs higher. Alloy grade 9, Ti-3Al-2.5V, is the most widely used in the golf clubs and bicycle girders. Alloy grade 12, it has the similar properties with the grade 7 but costs lesser. Alloy grade 23, Ti-6Al-4V ELI (Extra Low Interstitial) can be use in the medical appliance.